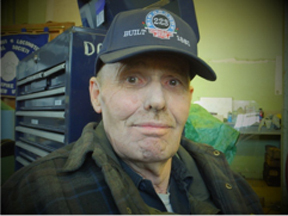 When John first began servicing diesel locomotives as a young man, he had no car so he took the Chicago rail transportation to the AT&SF 38th St. shop. Over the years, John became proficient as a mechanical maintenance man for the railroad and remembers working for $3.50 an hour in 1958. John faked his birthday at age 17 to get hired. In the army he shined by taking apart and rebuilding heavy equipment. The army made him a leader where he learned to read blueprints and put men to work. John earned a National Certificate as an auto/truck and industrial steam boiler systems mechanic. Even today John proudly states he has no need to take his cars to a shop and empty his wallet.